UPDATE (February 13th at 12:00 PM): Morrissey confirmed dates for a full U.S. tour. Tickets for most of the shows including the Detroit area show on June 14th go on sale Friday, February 21st. Some of the shows will have pre-sales -- Los Angeles, Denver, Atlanta, Memphis, Atlantic City, and Brooklyn have already announced pre-sales -- possibly more will be announced in the next few days. Morrissey has officially announced a pair of one-off shows later this year: May 10th he'll perform at Los Angeles Sports Arena, and June 21st he plays Barclays Center in Brooklyn. 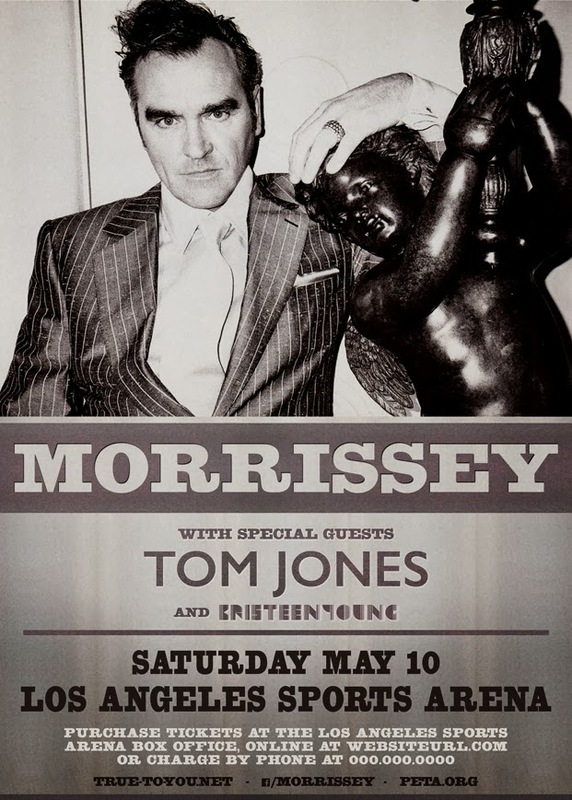 The opening acts for the shows are intriguing: Tom Jones supports Morrissey at the L.A. show and Cliff Richard will open the Brooklyn show. Kristeen Young also is on the bill for both shows. Ticket information is expected to be announced shortly. Morrissey announced earlier in the year that he's signed a worldwide recording contract and will be releasing a new album later in the year. Reminder: Two screenings of Morrissey: 25 Live will take place in the Detroit area on February 26th at the Berman Center for the Performing Arts in West Bloomfield. Purchase tickets for the 2pm screening and the 7:30 screening.